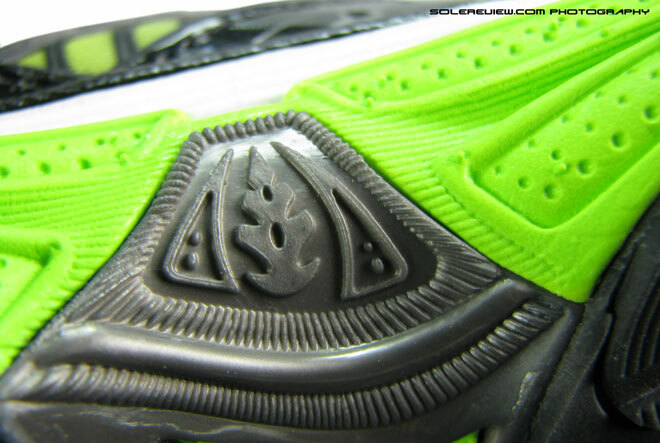 Midsole: Dual layer compression molded EVA, heel to toe DNA gel cushioning unit, thermoplastic (TPU) shank. 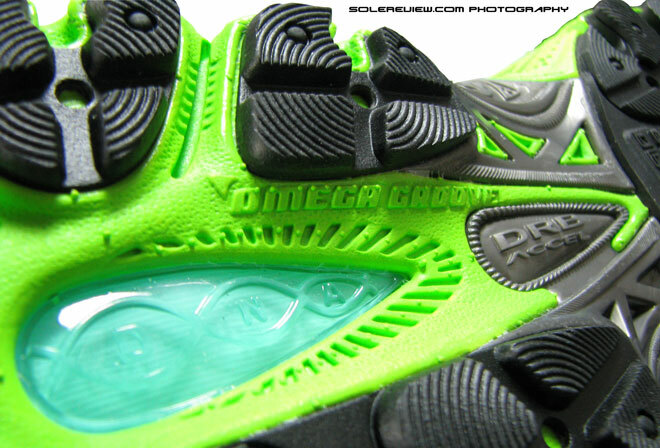 An extremely competent cushioned shoe for neutral runners. High marks for the use of premium materials, just right sole cushioning and roomy upper. Only let down is the weight, and the upper could do with more reflective bits. 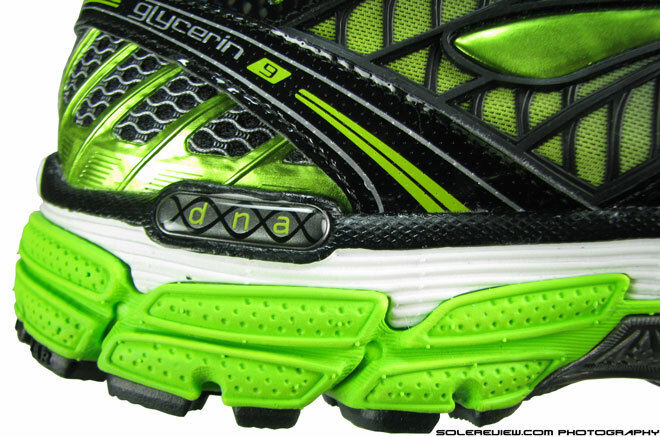 With the Glycerin 9 discontinued in Fall 2012, they should be available at generous discounts, making them great value for money. There is a lot of hype in the athletic footwear market. Being the competitive marketplace it is, brands spend a lot of time, money and resources talking about the ‘newer and better’ in their products. The result is a mixed bag, really. At times, the new features or the technology lives up to the hype, but in a lot of cases, it is more talk and less substance. 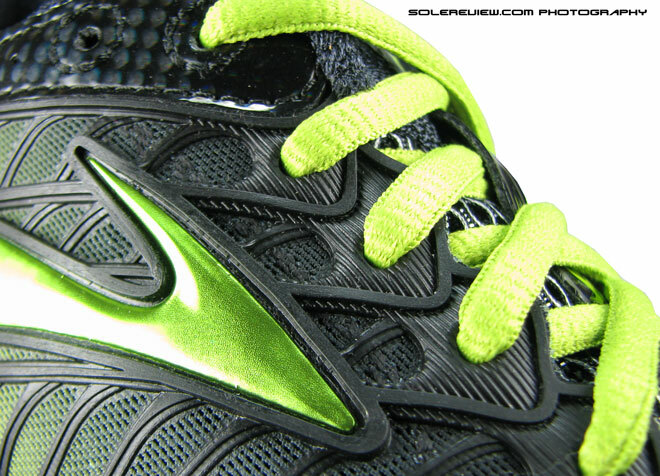 Happily, in the case of Brooks Glycerin 9, what you see and hear is what you get. 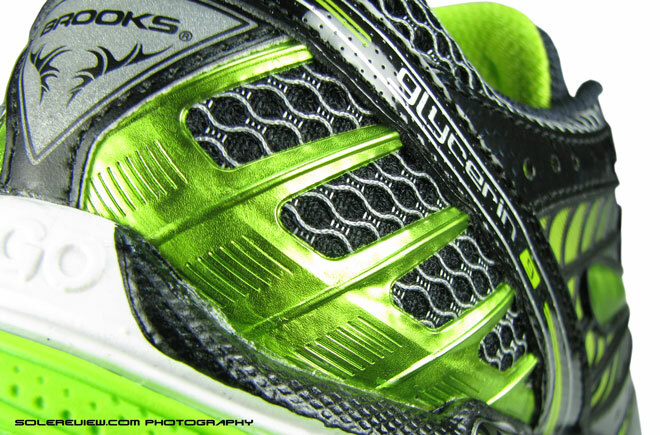 The Glycerin 9 is to Brooks what the Nimbus is to Asics and the Vomero to Nike. In short, it sits on the top of the cushioned-neutral shoe pyramid at Brooks, where the stratospheric price tags forces you to question your choice of employment. The Glycerin 9 retails at USD 130 (the newly released Glycerin 10 has upped its pricing to $140). With the $100+ pricepoint comes the promise of a luxurious ride from heel to toe, and as we mentioned in the last paragraph, the Brooks does live up to its claims. 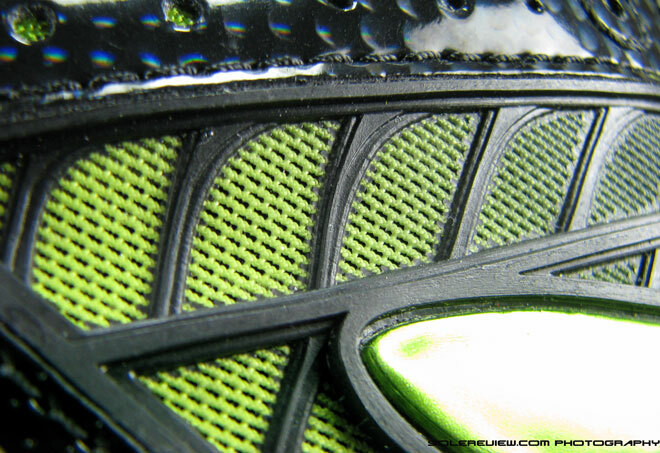 Among other things, the heart of the Brooks Glycerin 9 is a heel to toe ‘DNA’ cushioning unit (see our Ghost 4 review) which reacts and adapts to different pressures. Initially we were skeptical of the claims, but over the next many miles, 374 grams of mesh and foam trampled over any doubts we might have. Brooks claims that the DNA cushioning responds according to pressure applied on it – to sum up, when you are running slowly, the cushioning feels soft and as you gradually speed up, the cushioning firms up too. 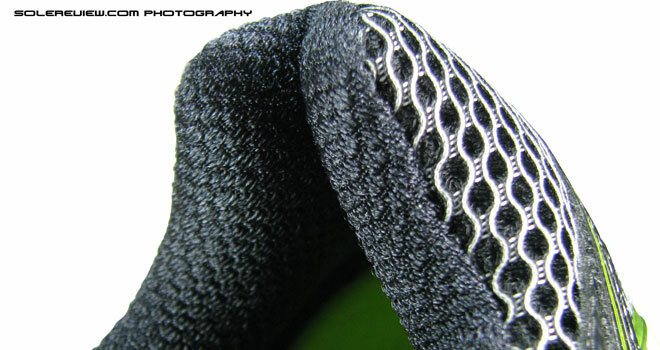 This results in better touch and go, in addition to increased stability. After putting many weekend runs on the Glycerin (we’ve tested this for over two months now) we are pleased to report that the DNA cushioning system does exactly what Brooks claims it does. 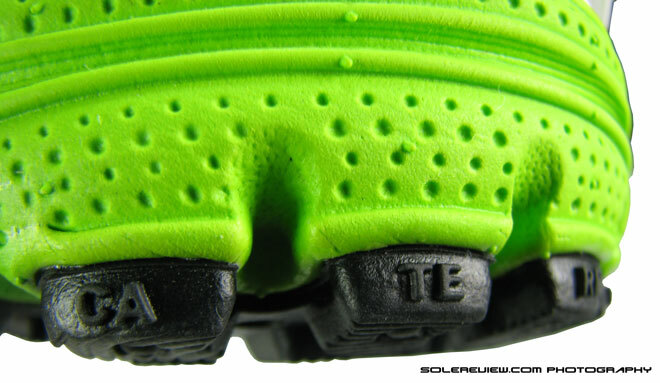 At slow running speeds, the DNA unit feels like it’s made of soft, yielding foam, and this sensation is pronounced in the heel section.The decoupled heel crash pad (which Brooks calls the ‘Caterpillar’) has deep flex grooves which isolates it from the main sole unit, and helps in a smoother heel landing, and efficiently guiding the weight forward. 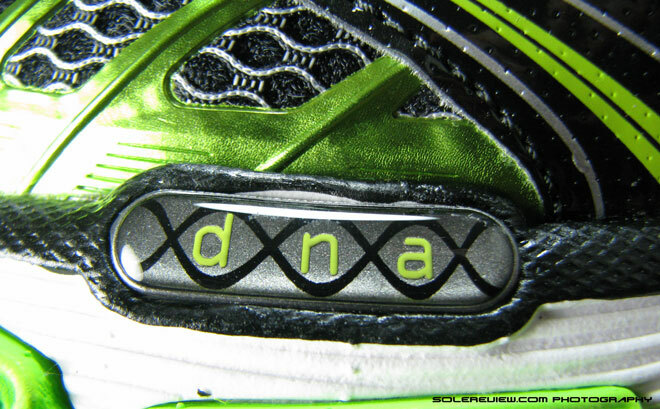 Start running a little faster, and the quicker footstrikes result in firming up of the DNA cushioning unit. This prevents excessive footsink, and you can actually expect a fully cushioned, neutral shoe to perform quick touch and go for increased running speed. It is to be noted that the midsole merely firms up instead of turning into a rock-solid cement slab, so there is still enough cushioning to go around. Even without the DNA cushioning platform, the overall midsole construction is also designed to aid overall stability and translate into a ride which is a middle ground between Goosedown-soft and firmness. 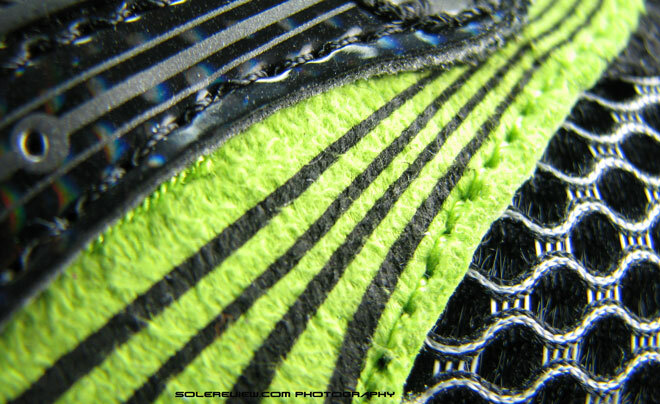 The dual density midsole has a combination of a softer midsole foam (in white) just under the foot, which is layered over a firmer (green) foam unit. The green base foam juts out a couple of extra millimeters outwards than the softer white midsole unit, so the former serves as a carrier foam base for the entire shoe – additional stability is provided by the minimally designed midfoot shank made out of hard urethane. So it is evident that the Glycerin 9 was designed with the goal of running slightly firm, without the all out pillowy plushness. Upfront, the forefoot flexibility is excellent owing to the deep flex grooves (‘Omega grooves’ in Brooks speak), exposed midsole area and use of blown rubber pieces called ‘Flexalon’. 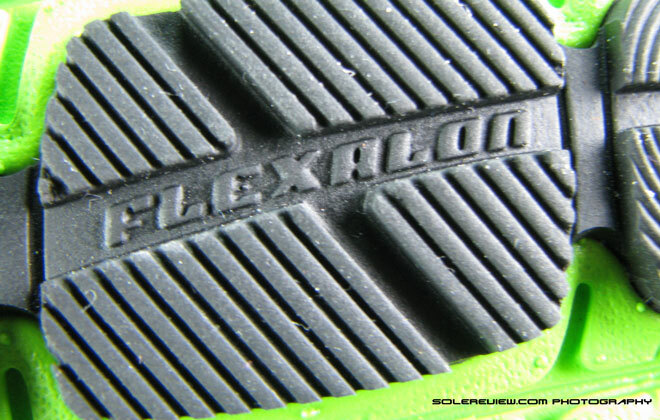 The blown rubber outsole area makes for a cushioned forefoot, with better flexibility than solid rubber. And as is the nature of many Brooks running shoes, the toe spring (distance of toe tip to the ground) is higher compared to, say, brands like Nike, so there is a sensation of being ‘tipped’ over as soon as the body weight transitions to the forefoot. 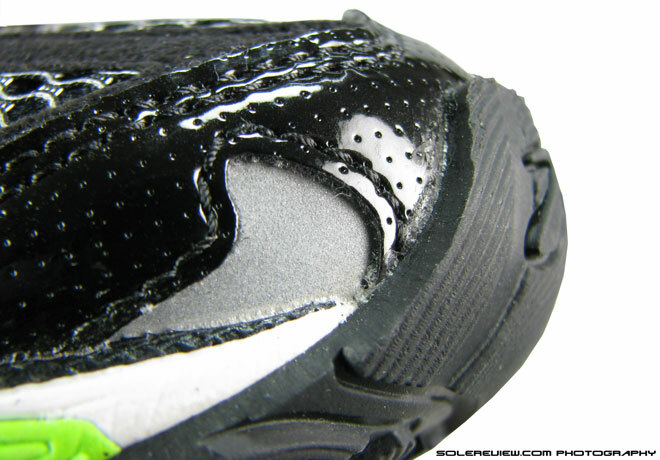 Outsole traction is super, coming from the use of multiple rubber pieces spread evenly across the surface of the outsole. Slip into the shoe, and the upper is superbly plush; the outer mesh is an open air, sandwich type, and the interior of tongue, midfoot and the heel area is lined with a padded fabric which has great skin feel. The tongue stays in place as it is attached to the sides, forming a sleeve. The Glycerin 9 uses a few types of synthetic leather on its upper – the forefoot part has printed and perforated panels on the sides, and the toe box is stitched over with a soft, felt like material which is also extremely flexible. 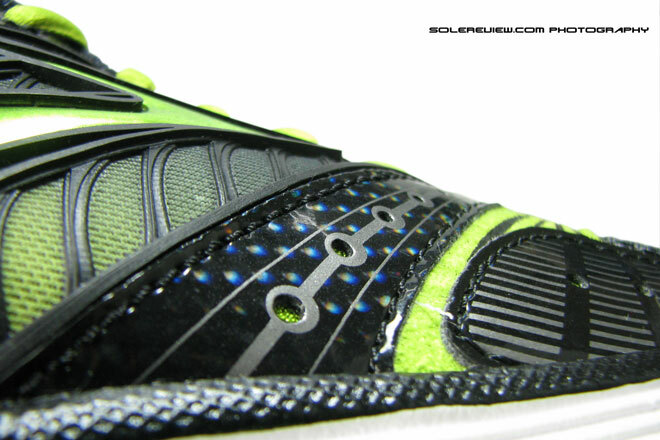 Midfoot is propped up by molded rubber components over a breathable mesh layer, which also has the Brooks logo built in. 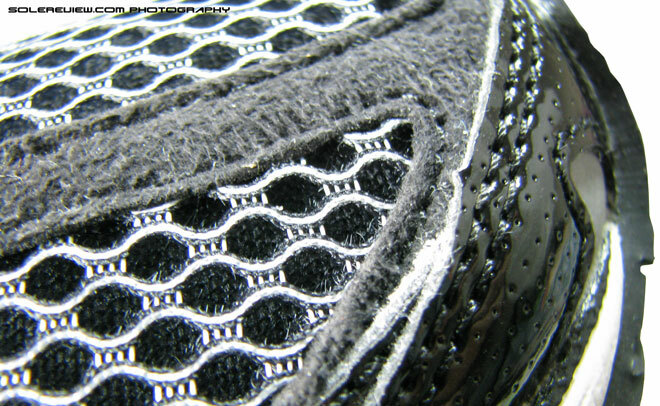 The external heel counter in the rear is made of molded plastic with thin, rib like projections running over the mesh towards the collar. The base of the upper is lined with a biodegradable ‘Bio-Mogo’ sockliner which is made of a molded EVA (Ethylene Vinyl Acetate) foam type. All of that works perfectly together to result in a fit which is very, very good – the forefoot feels roomy and unconstrained due to the use of the soft synthetic leather; while running, the material does not bend inwards or irritate. The midfoot fits snugly because of the sleeve construction and the soft padded tongue; in the rear, the padded collar and the skeletal heel counter do a fabulous job of keeping the heel from slipping. Ventilation performs at a high level too – in our multiple test runs spread over the last few months, we’ve not had a single instance of the Glycerin 9 heating up. In short – a neutral, cushioned running shoe with near perfect everything – be it level of materials, fit, the ride and overall attention to detail. Know that this is a shoe with all the bells and whistles expected of a premium cushioned shoe, so your feet will be happily disconnected from ground feel – and that is how the Glycerin 9 is supposed to be. We’d have gladly given a 5/5, if not for the weight and the low level of reflective bits which would have made the shoe better for running in low light conditions. We will review the new Glycerin 10 in November and see whether these areas have been looked at, but in the meanwhile, the outgoing Glycerin 9 is a amazing shoe which can be had at a great closeout price. 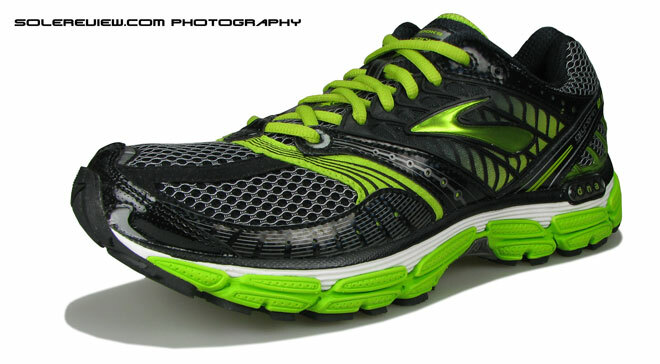 So if you are looking for a top of the line cushioned shoe for neutral runners at a low price, look no further.